The 2018 Arden Park Youth Triathlon will be held at Arden Park, located at 1000 La Sierra Drive, Sacramento, CA 95864 on Sunday, August 19, 2018. The transition area (Swim to Bike/T1 and Bike to Run/T2) will be in the main parking lot, and will serve as the hub of the race. 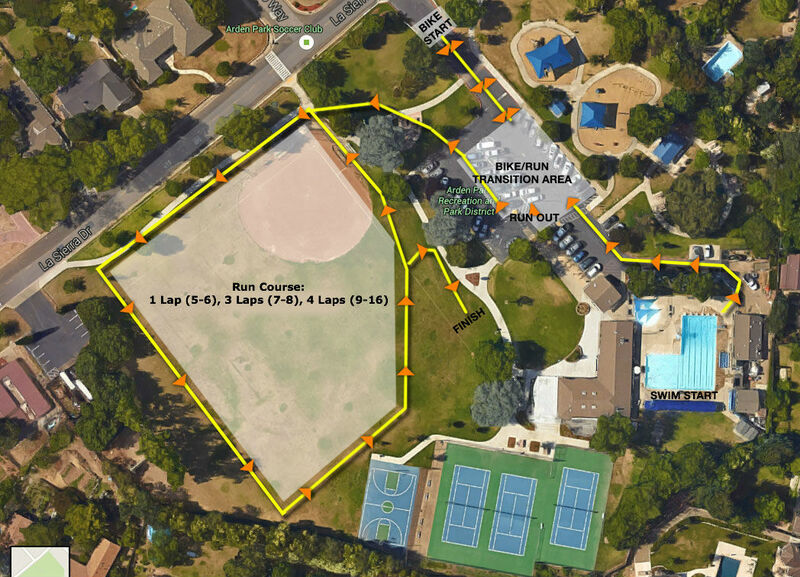 Athletes will swim in the lap pool located on site, bike along La Sierra Drive in a counterclockwise direction, and run around the adjacent baseball field and grass area also in a counterclockwise direction. 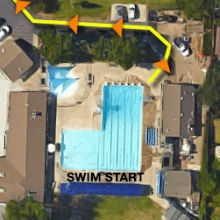 Participants will swim either 1 (5/6), 3 (7-8) or 5 (9-10, 11-12, 13-14, and 15-16) laps in the Arden Park pool. There will be two participants per lane. It is the responsibility of each participant to count their own laps (5/6 = 1, 7-8 = 3, and 9-16 = 5). However, we will have swim lap counters on hand to assist. 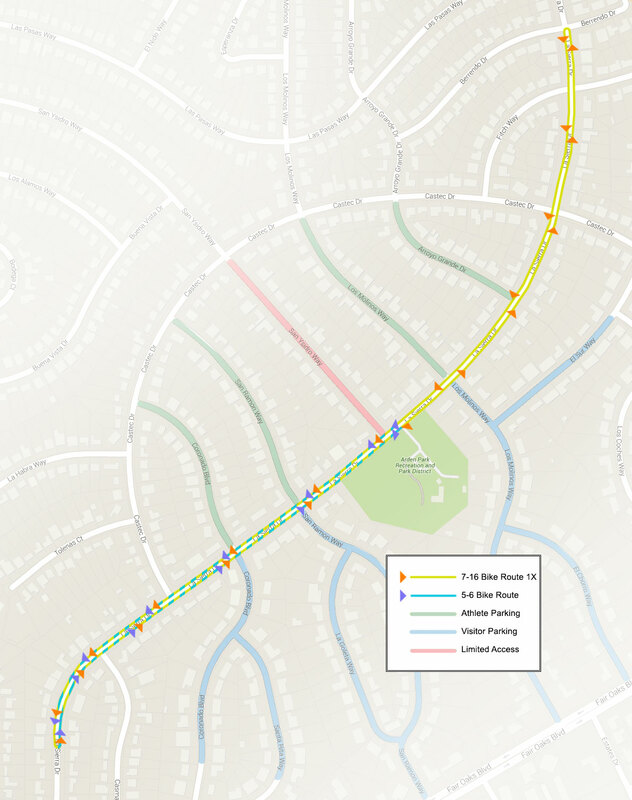 Participants will exit the park and turn RIGHT and ride on La Sierra Drive until they reach Berrendo Drive. 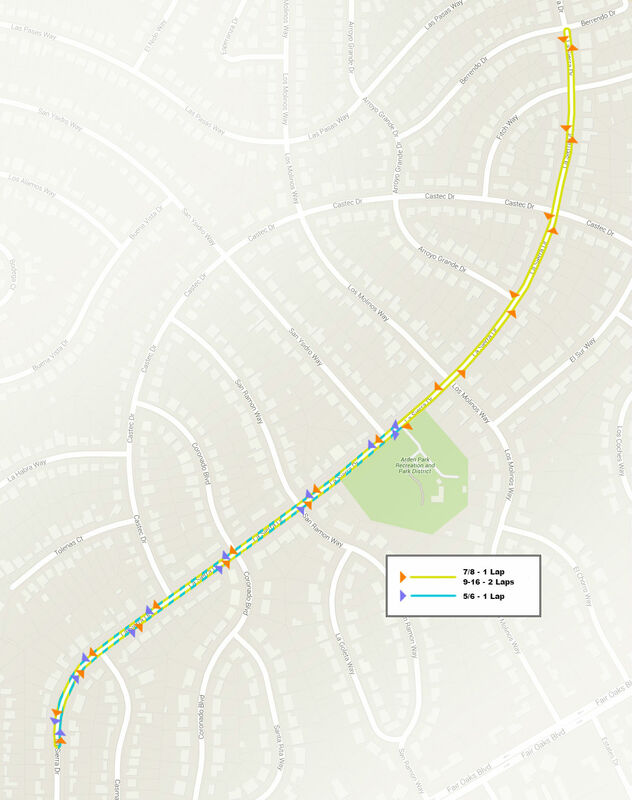 They will turn around and head down La Sierra Dr. once again until they reach the second turn around point just past Casmalia Way (riding in a counterclockwise direction). They will do this ONE time for all age divisions in 2018 (7-16 age groups) and then make a right back into Arden Park and enter the transition area. Upon entering the park, participants will rack their bike in its original location and prepare for the run. They will exit via the RUN OUT area toward the picnic tables and make a left toward the baseball field. From there, they will run a number of laps based on age groups (5/6 = 1, 7/8 = 3, all older age groups = 4) in a counterclockwise direction. After their final lap, volunteers will direct them to the finish line. Volunteers will hand out wristbands to each participant after each completed lap to help them keep track. 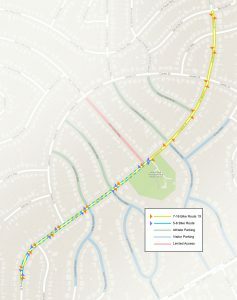 View map for illustration of the Run Out and run course to finish line area.